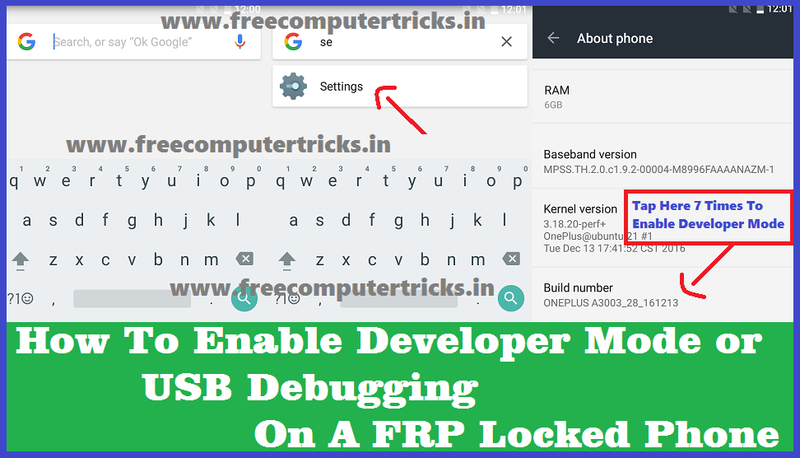 How to Enable USB Debugging on Locked Android Phone, How to Enable USB Debugging Mode ADB mode on FRP Locked, How to Enable USB Debugging Mode or ADB on FRP Locked? My phone is locked and asking Google reactivation Gmail Id and Password but I forgot it, how to enable USB debugging to remove FRP lock? Get all these questions solved here. There are various ways to get into a locked Android smartphone to enable Developer mode, enable OEM unlock and enable USB debugging to unlock the phone. If you are forgot the Email ID and Password synced before on that phone the this tutorial will help you to remove the factory reset protection FRP and use a new Google Gmail Id on it. Here we will show you all the possible ways to get into a locked phone and enable USB debugging or direct bypass the frp lock on any Android version operating systems. 1) Enable USB Debugging Using Home Button. 2) Enable USB Debugging Using Talk Back Option. 3) Enable USB Debugging Using Android Keyboard Options. 4) Enable USB Debugging Using TestDPC APK. 5) Enable USB Debugging Using Advance Recovery Option. How to enable developer mode and USB debugging using physical home button on your Android smartphone? Do you know if the Android phone has a physical home button then you can easily get into the phone and enable developer mode and USB debugging on that phone. 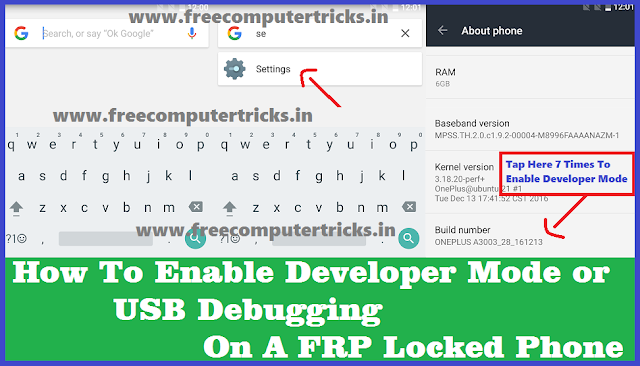 This method is working on most Android smartphones, if you are facing frp lock on your phone then you can give try this method to unlock frp lock or to enable USB debugging. This method will work if the phone has physical home button but may not work on the phone having soft home key. This technique works on all devices having Android 5.0 or Android 6.0 and also work on some devices which have Android 7.0 Mobile Operating System, those are not updated to the latest Android security patch. Hold the Home button Until you see Google App Search screen. Now type Settings and choose phone Settings from search results. Then go to About Phone and continuously tap on Build Number and when it shows now you are a developer, now stop and get back one step. Now you will see Developer Options just above the About Phone on the Settings Menu. Open Developer Options and now you will get most useful options there. You can also enable OEM unlock to allow the device to be OEM unlocked and do Factory Data Reset which reset your device to its factory default settings and this will erase all data including files and downloaded apps. You can also use Android Talk Back option to get into the Locked Android phone, then you can download and install any Android Launcher such as Go Launcher Oz APK and it will show the mobile desktop screen and also you can access the Settings of the phone. Then you can use Calculator method to enable USB debugging then you can do FRP Bypass using any free tool. In some Android 5.0 phone you can do direct unlock the phone by enabling the Developer Mode and OEM Unlock, then do Factory Reset the Android phone. 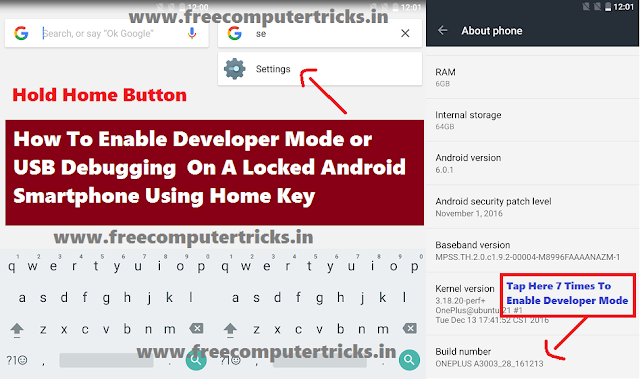 If the phone has physical home button or hard key (Soft Home Key May Not Work) then you can easily enable Talk Back option and get into the Locked Android device. On some Android smartphones also has the Accessibility option through which you can also get into the Locked Android smartphone on any Android version. How To Enable USB Debugging On A Locked Android Phone? All Possible Solutions Here. Continuously tap the home key 3 times to enable Talk Back option. Get the Video Tutorial To Know How to Enable USB Debugging Using Talk Back Option. In some Android device you can get a settings option in the Google Android Keyboard or Any other Android Keyboards, click on the settings icon on the Android keyboard and go to help and support menu it will open the support page online, now select any word and search on internet, it will open with the Google App and now you can search and open Mobile Settings by searching it on Google App. Every Android keyboard has the Settings icon, if you click and hold the symbol key it will show the settings icon and click on the settings icon to access the help and support page of the keyboard. If the phone has SwiftKey Android keyboard then you can easily use the above options to get into the Locked Android phone. To use this method change the Android default keyboard to SwiftKey and follow the above steps. This is one of the popular way to enable USB debugging using TestDPC Android Application. Install the application and setup manged profile or setup device owner then encrypt the phone, then restart the phone after switch on the phone press the power key to lock the phone and press it again to see the screen and then drag the screen from top, now you will see the settings icon, open the settings and enable developer mode and OEM Unlock then do factory reset the phone. In some Android device you will not have to follow the long process or do not need to use Encrypt option on the Test DPC Application, just install the application and press the power key to off the screen light and press again to on, now drag the screen from top and use the Settings icon. For Step By Step Process To Use Test DPC on your Phone Please Follow the Complete Tutorial Here. How to Enable USB Debugging and Developer Mode Using TestDPC (Test DPC Application) on a Locked Android Phone? Watch The Video Tutorial Here. This option can also be find on some Android smartphone, through which you can enable USB debugging without entering into the locked device. This option can be used by simply booting the phone into Recovery Mode and click on Advance options then choose "Reboot with ADB" and then connect the phone to computer and use any unlock tool to bypass Android lock on your phone. This feature you will get in some Oppo and Vivo Android smartphones. So these are the most important ways, by using it you can easily enable USB Debugging mode on a locked Android smartphone runs on any version of Android operating system.